Family Tattoos — Malan - Top Realism Tattoo Artist working from Germany, Neuwied. Family comes first - so family tattoos. Getting inked to show ones respect and caring for family is one of the most important reasons people get tattooed around the globe. So it is not surprising that there are so many ways to express family love with tattoo. Moments in life to get family tattoo may be so different as long is ones life. Giving a birth is often a powerful trigger, but it can also happen a bit later, when father feels extremely good connection with his growing up son, or mother is helping her daughter to choose her first dresses. Ideas for family tattoos are thousands, and each year arrive new one, or slight modification of older one. Advise to go personal with family tattoo, is probably the best that I can suggest. When preparing for that tattoo - look for times you spent together. That can be anything: pictures, favorite toys, hobbies or moments you share. You can never go wrong with that. Father and son tattoo I did. Picture of a boy was taken be me. We let him run around and I took few shots. Then, I added fake tattoos to his skin. One of them is Dad tattoo, second is my clients company logo. Even background holds some family tattoo symbolism. This family tattoo brings calm to a man that recently lost his brother. Woman is looking deeply, without fear into Death's eyes. In this tattoo we showed how small baby feet are in relation to fathers fingers. It is done from photo taken by my customer, just few days after baby was born. New life is a powerful moment in our life. We often want to celebrate that with new tattoo. For mother who got this tattoo family is important, but also maternity moments that changed her life. 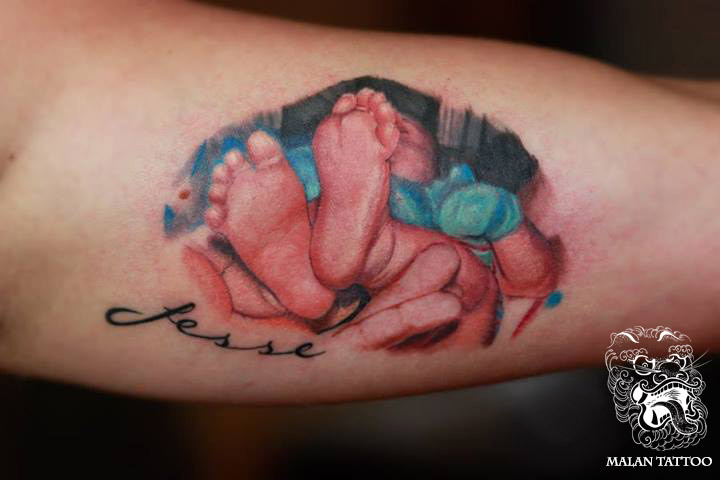 It is worth to mention tattooing portraits as a special part of what we do for our families.